Police attacked indigenous protesters in southwest Colombia an hour before they were supposed to meet with the country’s interior minister on Tuesday. At least one person was shot dead, according to indigenous authorities. In a press release, the Cauca Regional Indigenous Council (CRIC) said that an explosion was heard around 6AM and that around 7AM police attacked the thousands of protesters that are camping near the Pan-American Highway that has been blocked for weeks. According to the National Indigenous Organization of Colombia, at least one person was shot dead. At least one other person was injured after being shot at and an unknown number of protesters were allegedly beaten or hit by tear gas canisters in the violence. The offensive by riot police, members of the national army and armed civilians allegedly began an hour before the expected arrival in the nearby village of Santander de Quilichao of Interior Minister Nancy Patricia Gutierrez, who on Monday vowed to resume negotiations she had suspended on Thursday. Multiple people staying in the camps in Cajibio were injured because they were hit by teargas canisters or beaten, the CRIC said. Two protesters allegedly were hit by bullets. The CRIC said that heavily armed military personnel had taken position on strategic locations around the camp. Police said that they had begun unblocking a road in the vicinity of the camp that had been blocked by Afrocolombian communities in solidarity with the indigenous protests on Monday. At the time of publication, it was uncertain whether the minister would still travel to Cauca as promised. 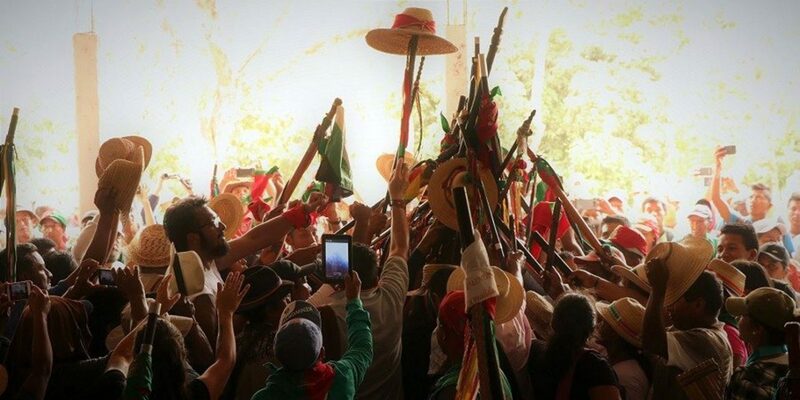 The violent outbreak followed a steady escalation of the protests that initially began in Cauca on March 10, but have since spread to indigenous reserves across Colombia and have received the support from farmers and afrocolombian organizations. On Monday, indigenous peoples from Meta said they would block the roads leading to important oil fields in the central province. The indigenous peoples demand the government comply with hundreds of made agreements in regards to access to ancestral land, healthcare and education. Furthermore, ongoing assassinations of indigenous leaders and the government’s failure to implement a peace deal with demobilized FARC guerrillas have exasperated the ethnic minority.